Article 51 of the Cambodian Constitution holds that the legislative, executive, and judicial powers in Cambodia shall be separate. In theory, this separation of powers is intended to place checks and balances on the different branches of government, separating the areas of responsibility and governance in order to minimize the power of any one branch. Additionally, mass media is often included as the “fourth estate” or fourth branch, because the press checks the other branches of government by demanding transparency, allowing for the healthy functioning of democracy. 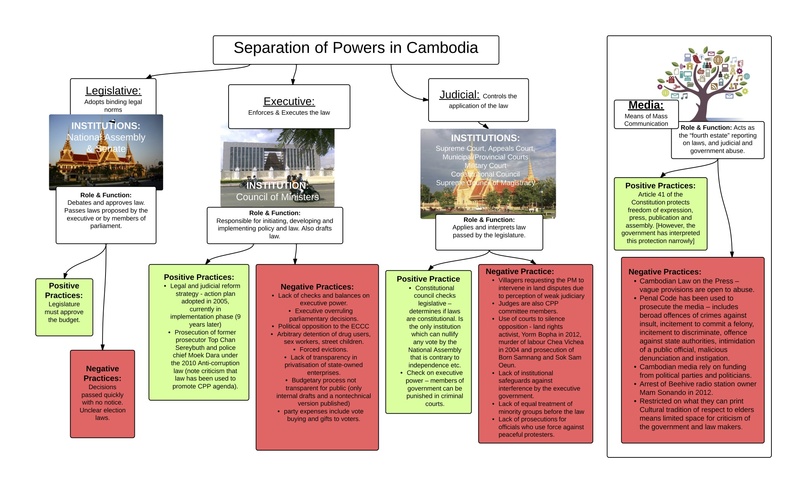 AIJI produced a summary chart of the separation of powers in Cambodia today, highlighting the role & function of the branches as well as their positive and negative practices.